Imagine the scene: sparkling white lights, fire burning brightly in the hearth, everyone waiting at the table to be served the main course, you run down to the basement to grab that final touch and, uh oh, water everywhere! This type of disaster happens to many homeowners but there are ways of prevention if you know what you are looking for. The Pittsburgh Drain Guys have many indoor solutions including the installation of interior French drains, a number one way of preventing water from entering a basement, in the Pittsburgh area. Here are some reasons why you would be getting water in your basement. When you go into your basement, you may feel like it’s an icebox compared to the rest of your house but in comparison to the outside, frozen ground, it’s warm and toasty. And considering our winter environment, the heat radiating from your basement will cause the snow and frozen earth to melt and seep into your basement, by means of hydrostatic pressure. Hydrostatic pressure is basically gravity, but a bit fancier: when the ground around your basement melts, the pressure from the moisture builds up and has to find an outlet so it is pushed down by gravity into your basement. In addition, the hydrostatic pressure can create new cracks in your basement to alleviate some of the pressure. The installation of an interior French drain or some other type of waterproofing of your basement by the Pittsburgh Drain Guys can take care of this type of moisture easily. Give us a call today to discuss options with us and make next holiday season the best ever! These very important elements to your home are engineered and installed to direct rainwater and other moisture away from your home. If they are improperly installed, functioning improperly, or due to a lack of maintenance not working, then they could be causing moisture to seep into your home’s foundation. Make sure that you maintain your gutters and spouts to prevent any damage from these elements. Cracks will inevitably occur in your basement floor as time goes on and your house settles over the years. 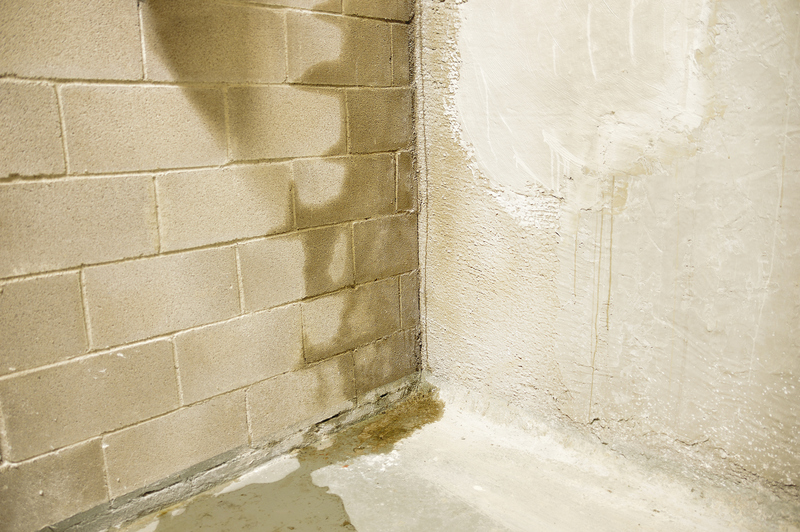 Water may push itself into these cracks due to the pressure of the moisture in the soil outside your walls and floors. The slope surrounding your home is not a good six inches away from the foundation, the standard in which to keep the water from infiltrating your basement. Certain types of soil will take in and hold moisture better than other types of soil. Clay soil is a good example of a soil that holds onto moisture and a good filler around a home. Your basement windows are leaking and need to be replaced! The Pittsburgh Drain Guys can help with these problems and more by working with you to come up with a solution to waterproof your basement. This may include the installation of an indoor French drain, a trench that will direct water away from your foundation and out of your home. A French drain can make all the difference in some of these situations; call us today to discuss your options!